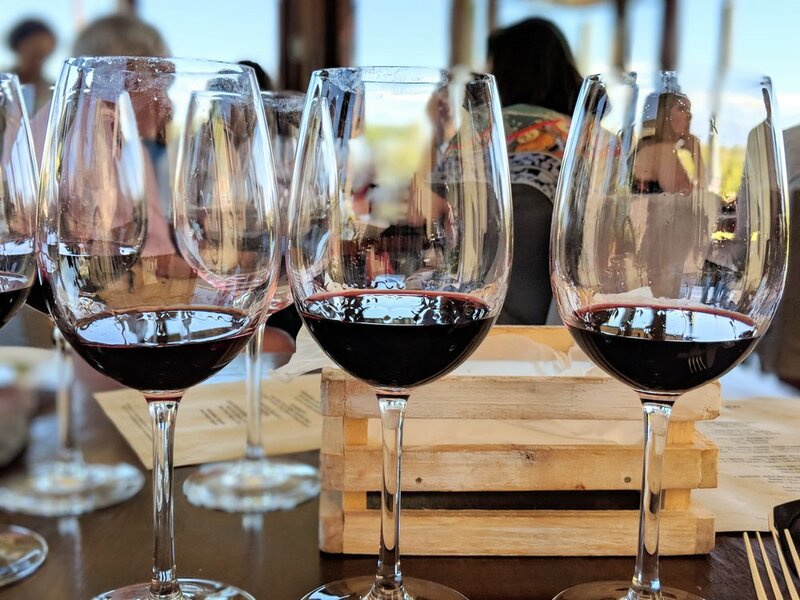 From large wineries to boutique bodegas, Mendoza has every type of wine tasting experience for you. Between Randy and myself, we’ve been to notable wine regions such as Napa Valley, Australia and South Africa. We mostly took day trips to these. But to stay in Mendoza for a few days was an amazing experience. It could definitely pass as a honeymoon spot. You can’t compare it to any of the other wine regions as they’re known for Malbec. Most of the tourists we spoke to who had been to Mendoza recommended touring the wineries, or bodegas as the locals call it, by bike. That would have been really cool, but the only way we would do that with our baby is if a bike company had a trailer and if there were really great bike paths. After arriving there and noticing that there are so many different types of wineries, we wanted to take our time at each one and go by taxi. The wine region is at least 30 to 45 minutes away from the city and airport, so we decided to stay closer to the bodegas. We stayed at a really nice Airbnb in Lujan de Cuyo. The hosts were really great. They had a separate house behind their home where we stayed. It was a family of three. Their son spoke pretty good English and helped us with recommendations, making reservations and getting taxis since Uber doesn’t exist in Mendoza. Now on to our amazing experiences at different types of bodegas. 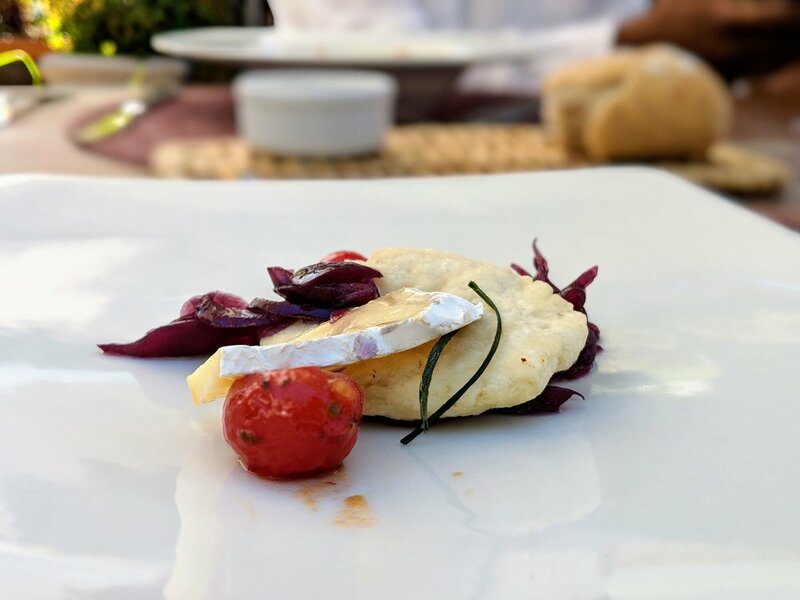 We started off our wine tasting experience with a seven-course meal and wine pairings. 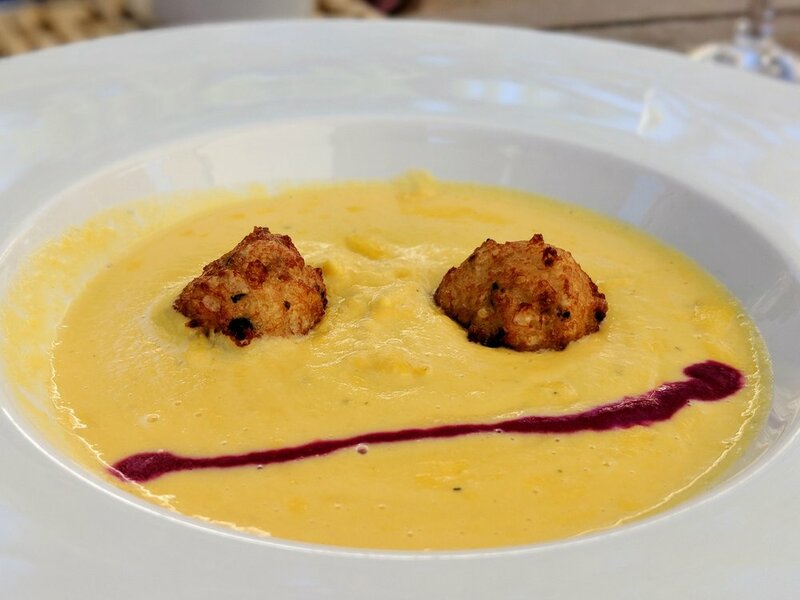 That’s right — a seven-course meal! We both had never done that before. It was totally worth it. And yes, we brought our baby along. Ruca Malen wine is only exported to certain countries, and only a few wines are exported to the U.S. It has many international awards as well. 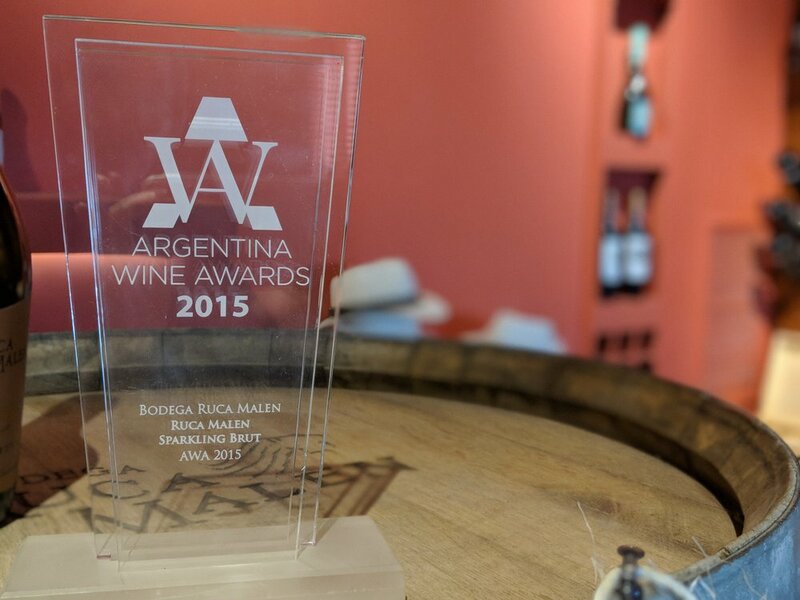 In 2013, Ruca Malen was awarded with the “Best Winery Restaurant Experience in the World” by the Global Best of Wine Tourism. So we decided this was a must-do. You have to make reservations. After experiencing this amazing meal, the $75 each was absolutely worth it. We sat in a glassed-in porch, overlooking the vineyards. And for a Monday during low season, it was packed. Every dish and pairing was well thought out and absolutely delicious. Some of the courses were super small, but in the end we were very satisfied. We ate and drank for three and a half hours! Samindra was really well behaved, as she always is. She even had an hour nap while we enjoyed the main course. You may have heard of Trivento as most of their business is for export. So, this was a much larger winery. They have vineyards all over the Mendoza wine region. And they have 4500 French and American oak barrels. Using French and American oak barrels is the standard for wine makers all over the world. The process for wine making is very similar across the board, but each winery has their own special touch. During our tour, we learned Trivento is using a new type of technology to ferment some of their wine. They’re using concrete, egg-shaped vats to ferment some wine. This gives the wine a different taste to the mouth. The wine is being circulated on its own in this type of vat instead of the traditional stainless steel vats where the wine makers have to manually circulate the wine. The concrete eggs are much more expensive though so Trivento only has a few of them. We started of the tour in the art gallery lobby with some champagne. After visiting the fermentation room, seeing the thousands of oak barrels, of which some were from Missouri, and one of their conference rooms with special oak barrels in the background, we had the rest of our tasting back in the art gallery. Subscribe to our newsletter for more travel guides. On our last day just before we had to go to the airport that evening, we went to a boutique bodega called Clos de Chacras. This was highly recommended by our Airbnb hosts. The mother, Adriana, who used to be a chef, spoke highly of Chacras. It was less than 10 minutes from our Airbnb in Lujan de Cuyo. Adriana dropped us off, again so sweet of them. This winery had such an intimate feel even though there was just one other couple on the tour with us. Clos de Chacras has been around for a long time. But back when they first started, they were more focused on a much larger wine business. Our tour guide took us down to the cellar where they used to make wine. We stood in a huge room that used to be a vat for wine. Now that they’re not focused on making hundreds of thousands of liters of wine, they use that area for aging their wine in barrels. And they’re now more focused on smaller batches of wine. The vineyard is only at the bodega. Clos de Chacras is also award-winning both nationally and internationally. However, we didn’t have enough time for the seven-course meal, so we had a three and four-course meal. Both were outstanding.The four-course meal featured dishes made with the Malbecs. One of the main courses included steak with chocolate sauce. Exploring wine country Argentina is definitely a must-do and a place to return to. It can also be done with a baby. So, let us know if you have any questions by writing a comment below. Be sure to subscribe to our newsletter to not miss out on more travel guides and baby travel tips.